​Make a set of smelly containers with cotton balls and paper cups. Saturate a cotton ball with lemon juice or essence, perfume, vinegar, vanilla, coffee, etc. Also piece of onion, orange, soap, garlic, be creative. Have the children take turns, smell the contents, and either name it or describe the smell. Encourage new vocabulary, such as aromatic, odor, fresh, putrid, minty, acrid. What part of your body are you using to smell with? We all have noses, and animals have noses too. Show photos of lots of people noses, different shapes and sizes, and all used to smell. Show animal noses, such as dog, cat, elephant, pig, bird (nostrils), horse etc. ​Our sense of smell is in our nose – way up inside the nostrils is a special area that can “catch” a smell floating though the air, and sends a message to our brain, and our brain figures out what the smell is. Sometimes we also use our sense of taste to help us decide what the smell is. Those 2 senses quite often work together. 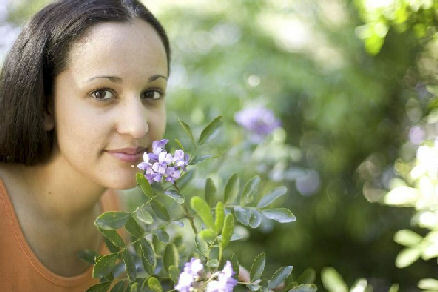 Smells not only make our lives more enjoyable, when we smell food and flowers, there are also some smells that we might not like as much. Can you think of some examples? (Trash, toilets, dirty socks, bad food, heavy smoke). Sometimes a strong smell might warn us of a danger of some kind, for example, food burning on the stove. Sometimes, if you have a stuffy nose or a cold, you can’t smell (or taste) anything very well. Why do you think that happens? Humans don’t really have a strong sense of smell, compared with some animals. Can you think about why that is? Animals, especially in the wild, can smell an enemy coming from a great distance, and so they are able to run away. They also need to be able to smell food and water, so they can continue to live. ​​Rub a cinnamon stick on a circle or square of sandpaper. Punch a hole in it and wear it as a necklace. Make a flower from colorful tissue and a green pipe cleaner. Spray some perfume on it. Draw and cut out a bee to sit on the flower. Make a bouquet of flowers. Make a clipart card activity – animals that have a strong sense of smell. Child picks up a card, and describes what the animal might like to smell. For example, a dog might like to smell: dog food, water, bone, meat, cat, etc.